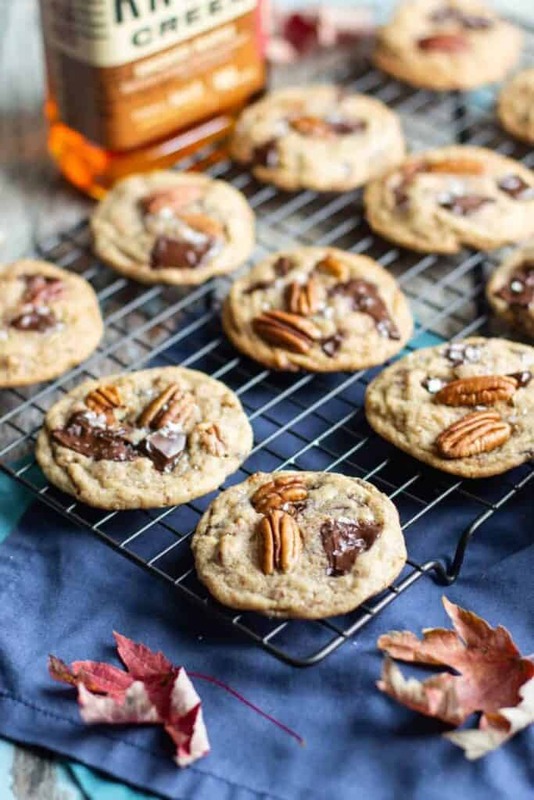 I’ll admit, there’s a lot going on in these Maple Bourbon Chocolate Chunk Pecan Cookies. Heck, the name itself is a mouthful. But trust me. And stay with me here! All of these flavors and textures are dang near perfect together. I mean. 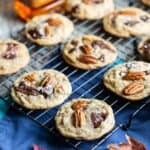 Chewy cookies studded with melty dark chocolate and crunchy pecans, topped with sea salt, AND a hit of sweet maple bourbon flavor? Come on. 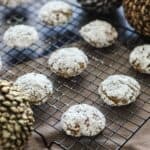 These cookies include some of the same delicious smoked maple bourbon that I used to make these Maple Bourbon Moscow Mules. 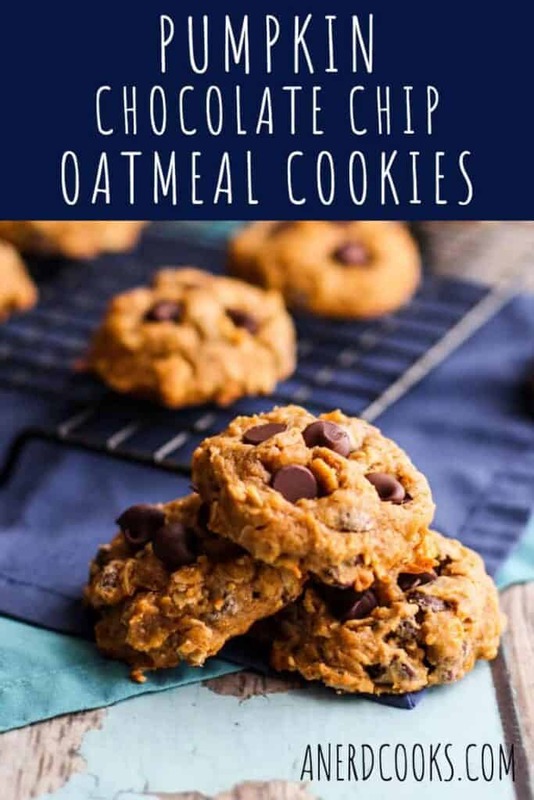 While the maple version isn’t 100% necessary, I do think that it tastes particularly good with the brown sugar heavy flavor of these cookies. It also makes them extra Autumnal, in my opinion. 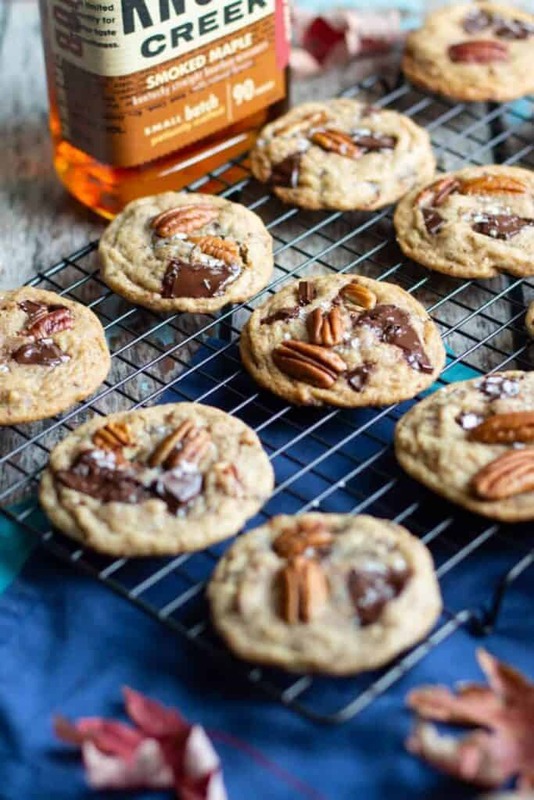 Looking for more bourbon-y baked goods? Mini Bourbon Pecan Pies and No-Bake Bourbon Balls are always a hit! In the mood for a cocktail? How about a Bourbon Pumpkin Shrub Cocktail, Bourbon Moscow Mule, or Maple Bourbon Moscow Mule?? This recipe comes from Baker By Nature. Place the butter in a small saucepan over medium-high heat and cook for about 3 minutes (stirring pretty much constantly) until the butter has browned. Pour the brown butter into a heatproof bowl. Make sure to scrape all of the toasty, brown bits into the bowl as well. Place the bowl in the refrigerator for 2 hours, or until the butter is at room temperature. It should not be liquid at all. Melt the butter in a large skillet over medium heat. Add the chopped pecans and maple syrup and cook, stirring occasionally, for 4-5 minutes. Set them aside until needed. Preheat the oven to 375 degrees F. Line two baking sheets with parchment paper and set aside. In a large bowl, whisk the flour, kosher salt, cinnamon, and baking soda together. Set aside. In the bowl of a stand mixer, on medium speed, cream the brown butter and sugars together until light and fluffy. Add the vanilla and bourbon and beat until combined. Add in the eggs, one at a time, beating until they are totally combined. A little at a time, add the flour. Mix until the flour has just disappeared. Add the chocolate and pecans. Mix to distribute throughout the dough. 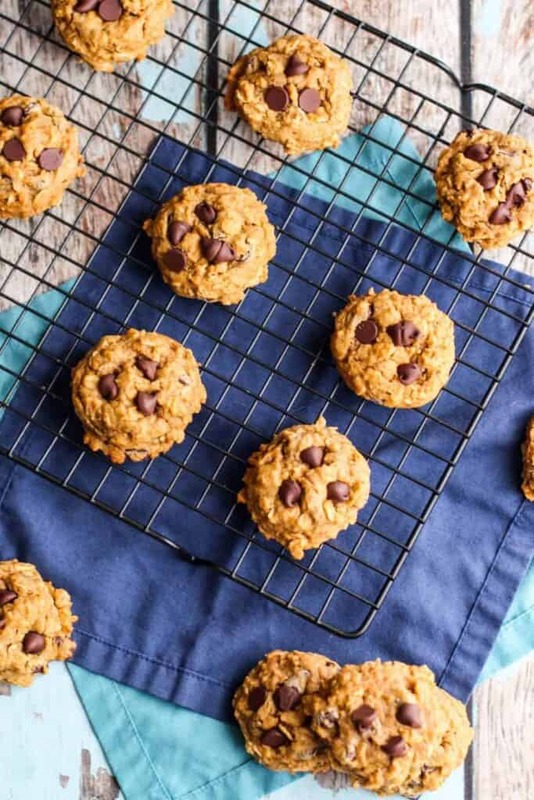 Using a cookie scoop, portion the cookie dough out onto the prepared baking sheets. 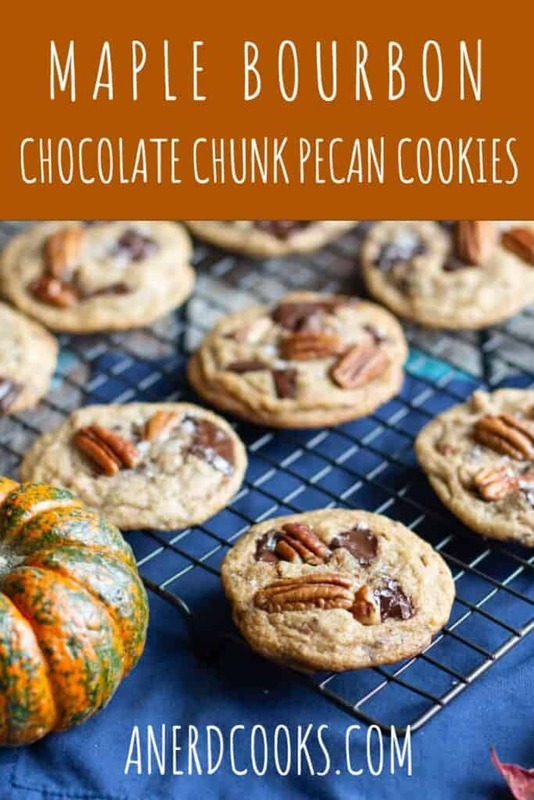 Press pecan halves and chopped chocolate into the top of the cookie dough, if desired. Bake 9-10 minutes, or until golden brown at the edges but still soft in the middle. Sprinkle with sea salt. Allow the cookies to cool on the baking sheets for 5 minutes before removing them to a wire rack to finish cooling completely. 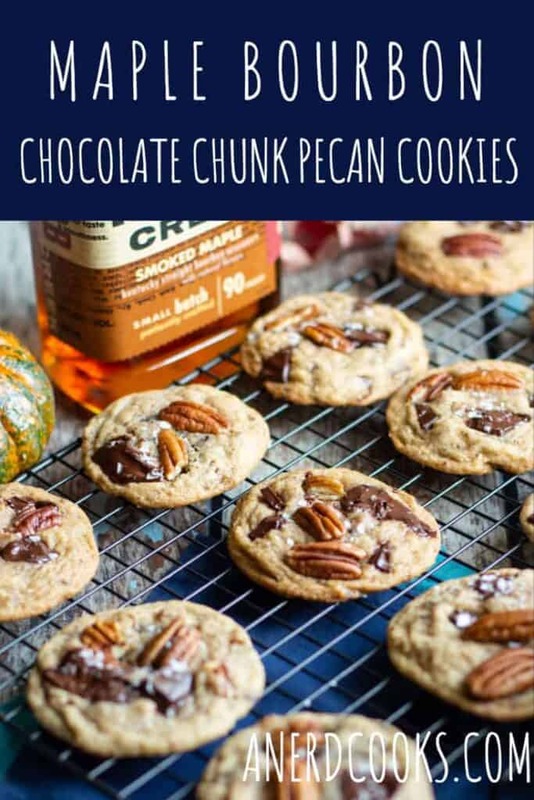 I pressed more than 1 pecan half into the top of each cookie, but you do you. 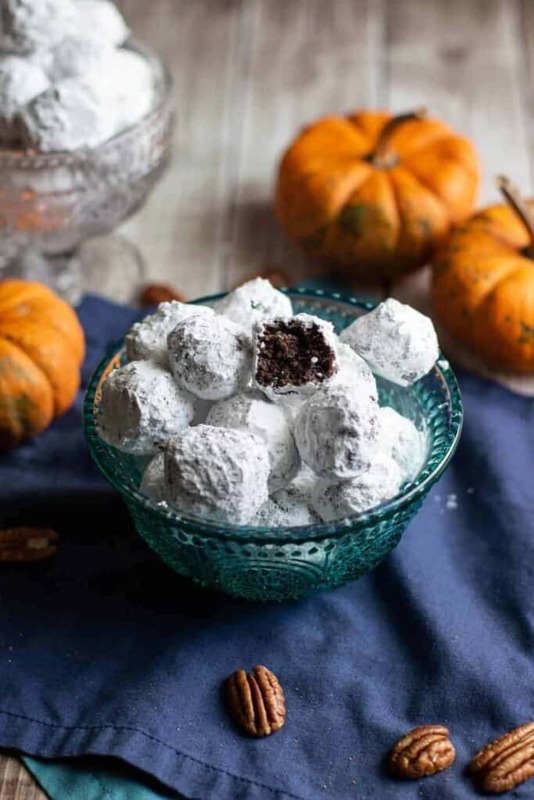 These No-Bake Bourbon Balls are the perfect sweet and boozy treat. Best yet? You don’t even have to turn on the oven to make them! Some may consider it a little early in the year to break out the bourbon balls. But I’m of the opinion that it’s officially Fall, which means that it’s basically Thanksgiving. And if it’s Thanksgiving, then Christmas is right around the corner. Right? Okay so maybe this is a stretch. 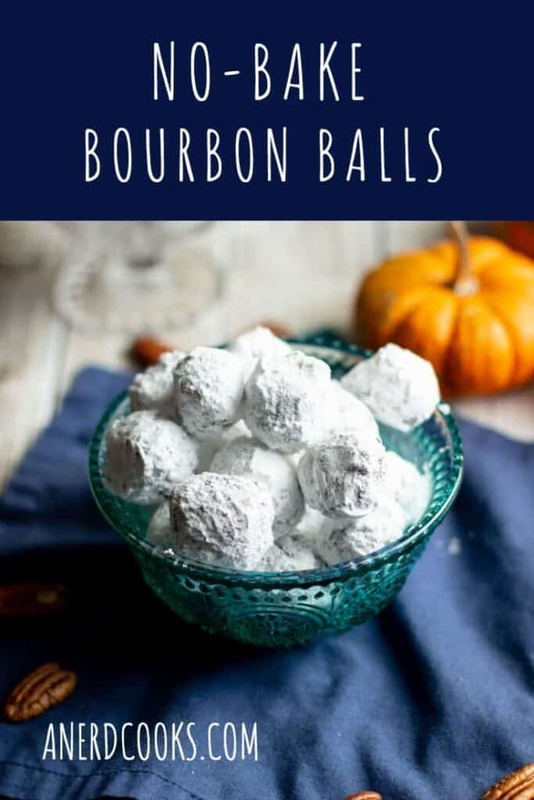 But I still think that there’s no wrong time to make bourbon balls. I was recently tasked with concocting a variety of bourbon-based sweets for a bourbon-themed (!!) 40th birthday party. 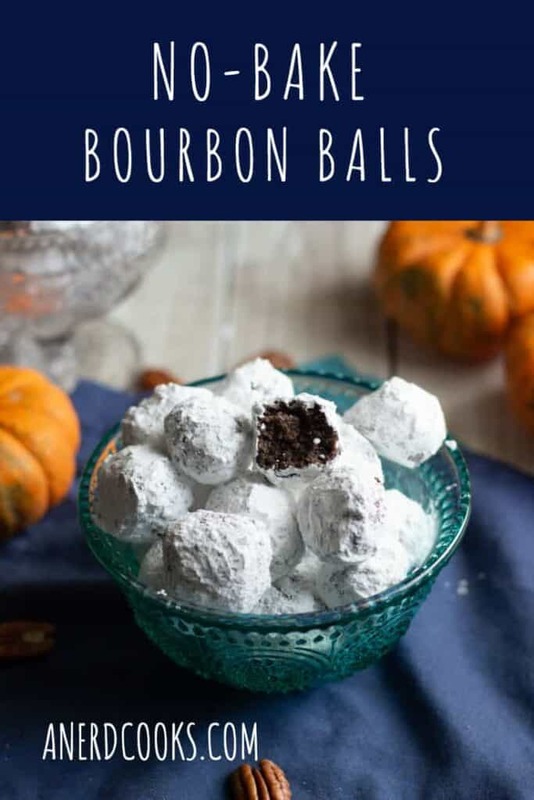 These No-Bake Bourbon Balls were one of the treats that I whipped up. Even after decreasing the amount of bourbon in the recipe slightly, the bourbon flavor is still pretty potent. Watch yourself! 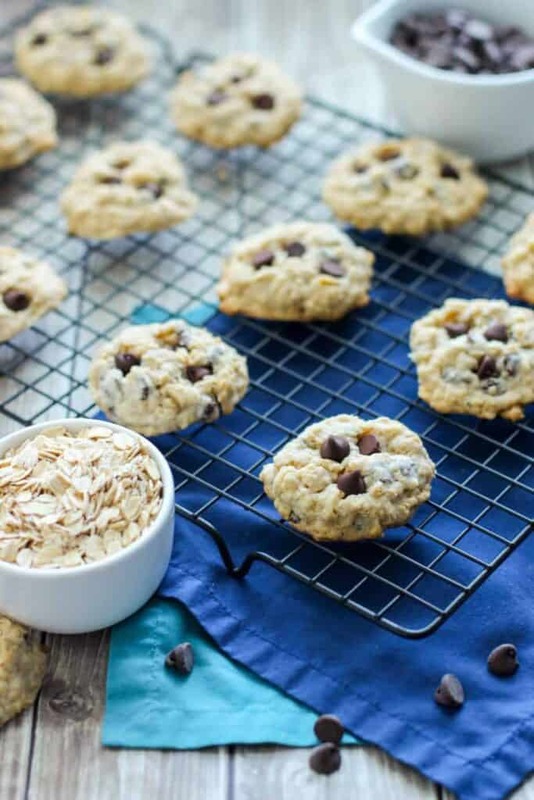 Need more no-bake cookie action? 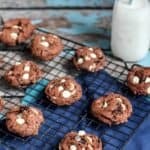 How about these Hot Chocolate No Bake Cookies? I found this recipe on Saving Room for Dessert. After testing this recipe out on my lab, the only change that I made was to use 3 tbs of bourbon instead of 4. 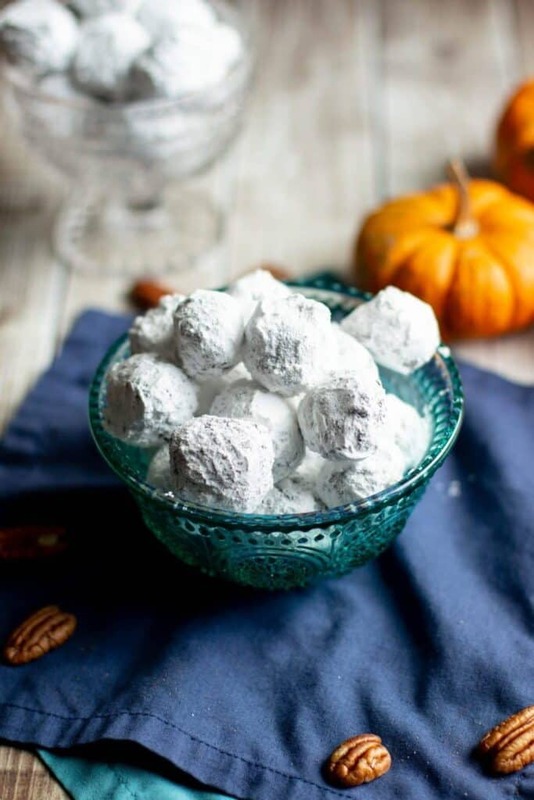 In a large bowl, combine the vanilla wafers, pecans, 1 cup of powdered sugar, and cocoa powder. Whisk to combine. In a mixing cup or small bowl, whisk the corn syrup and bourbon together. Add the corn syrup/bourbon mixture to the dry ingredients and mix to combine. Place the remaining 2 cups of powdered sugar in a shallow bowl or pie plate. 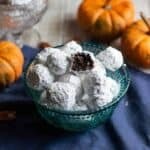 Roll the dough into 1-inch balls, then immediately roll them in the powdered sugar. 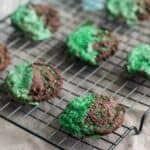 Set them aside on a baking sheet for 1 hour. After 1 hour, roll the cookies in powdered sugar again. Store the cookies in an airtight container in the refrigerator. Notes: I ran the vanilla wafer cookies and pecans through a food processor to ensure that they were finely ground. 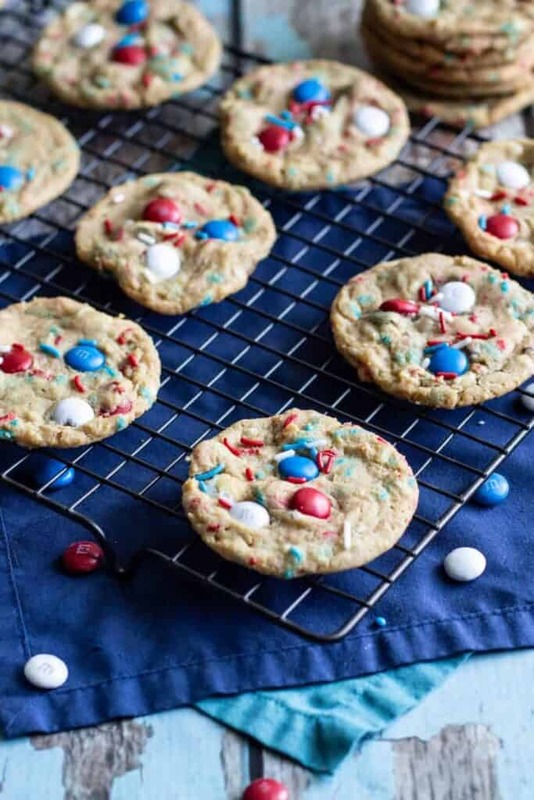 These Firecracker Pudding Cookies are soft, sweet, and all dressed up for the Fourth of July. Happy birthday, America. 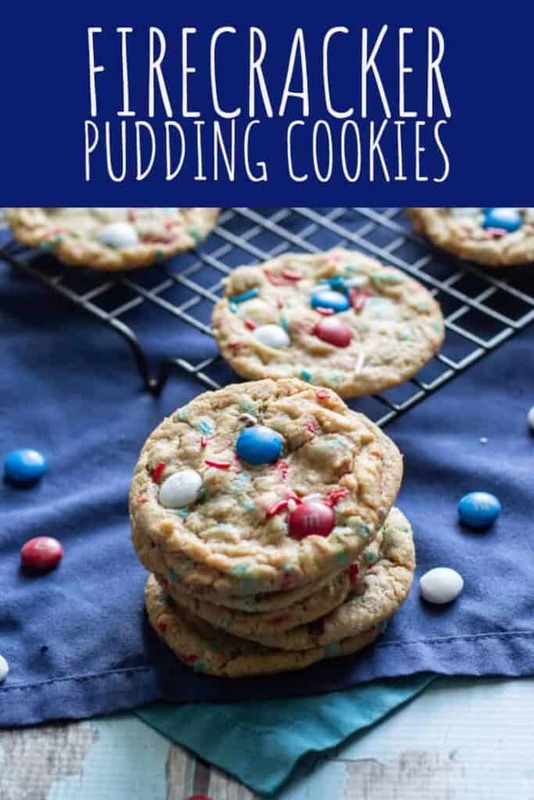 I know I post about pudding cookies pretty often (go ahead and take a look). But there’s a good reason for it. They are consistently delicious! Plus I think that they come out being good looking cookies just about every time, too. 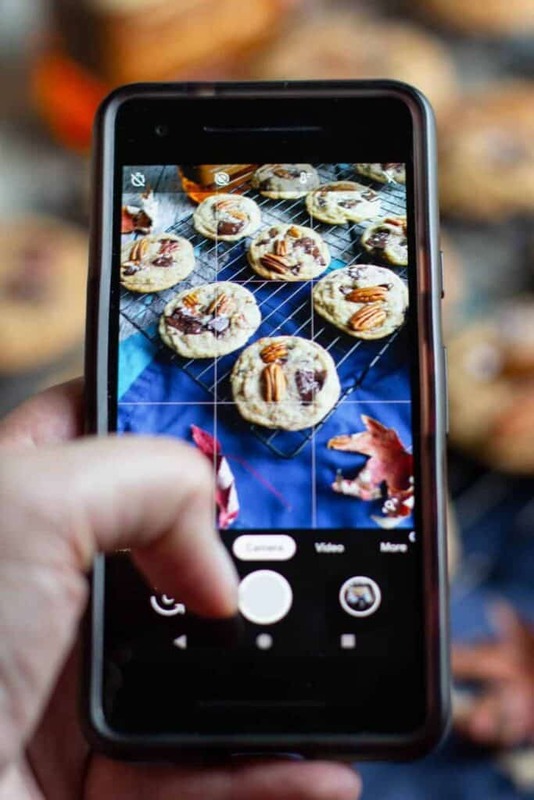 There’s nothing wrong with an ugly cookie (provided that it tastes good), but ugly cookies aren’t exactly photogenic for a food blog. Pudding cookies are also endlessly customizable. Switch up the mix-ins and pudding flavors to suit your needs. I obviously went red, white, and blue for the Fourth of July, but you can switch things up for any holiday or occasion. This recipe is adapted from one found on Crazy for Crust. In the bowl of a stand mixer, cream the butter and brown sugar on medium speed. Beat in the egg and vanilla extract until smooth. Add the pudding mix, baking soda, and kosher salt. Mix until combined. Add the flour. Mix again until well combined. Scrape down the sides of the mixing bowl as needed. Add the sprinkles and M&Ms and mix on medium-high speed until they are well distributed throughout the cookie dough. Line a baking sheet with parchment paper. Scoop ~1.5 tbs balls of dough onto the prepared cookie sheet. Cover and chill for at least 1 hour. When you’re ready to bake the cookies, preheat the oven to 350 degrees F. Line two baking sheets with parchment paper. Place the chilled balls of cookie dough on the prepared baking sheets, approximately 2 inches apart. Bake 9-11 minutes, or until the edges just start to turn brown. Remove the cookies from the oven and press additional white chocolate chips into the warm cookies, if desired. Allow the cookies to cool on the baking sheets for 5 minutes before removing them to a wire rack to finish cooling completely. 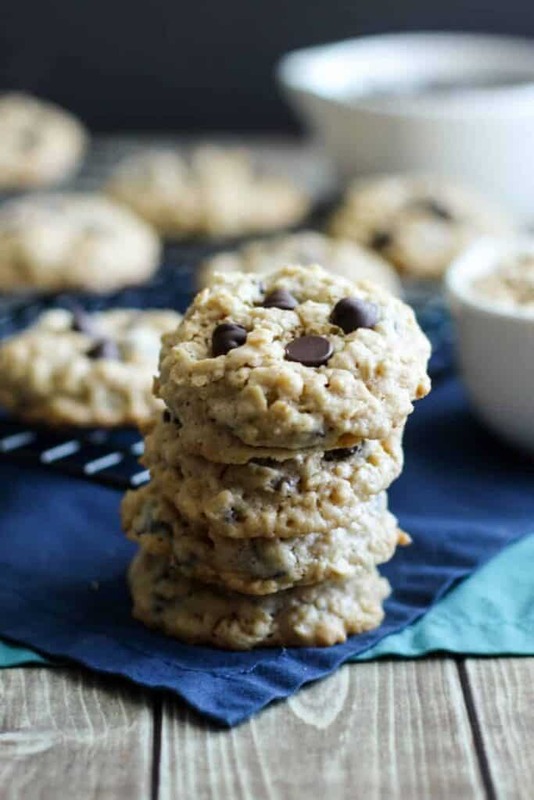 Some days, there are few things more satisfying than the simplicity of Oatmeal Chocolate Chip Cookies. Sure, the flavors aren’t particularly complex. But they’re sweet and chewy, and totally delicious. Complexity can be overrated, I say. I haven’t really addressed this yet, but here goes… You may have noticed that things are looking a little different around here lately. 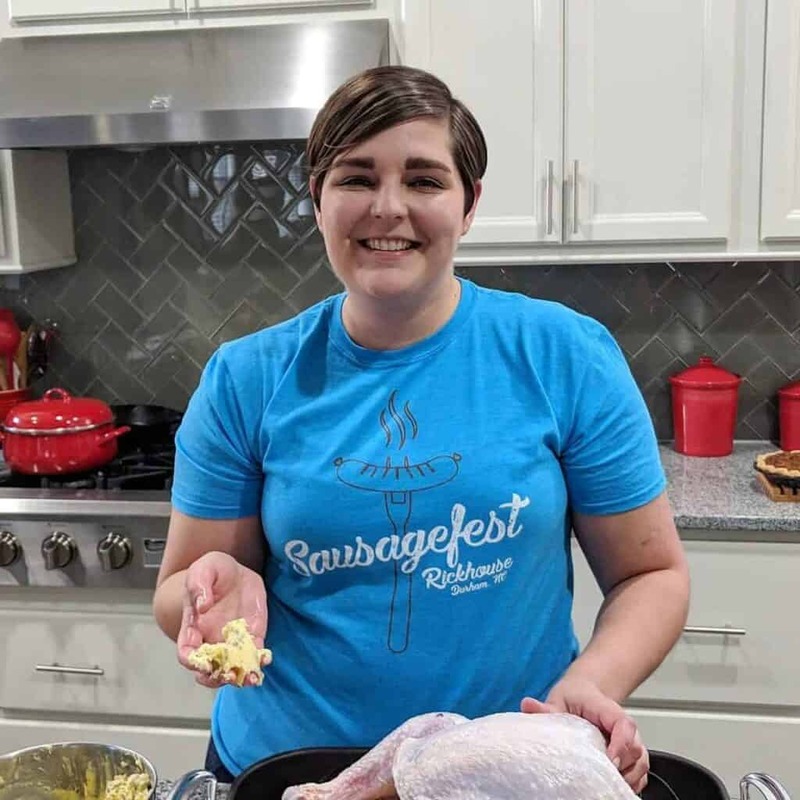 I finally took the plunge and decided to take my blog self hosted! Basically this means that I now have all the creative control over the functionality and appearance of A Nerd Cooks that I could ever want. It’s a bit of a work in progress since it’s just me working on this, not a team of people. So if you happen to come across broken links or missing photos (or anything else that looks wonky), please bear with me. Also feel free to also shoot me an email to let me know! I’m steadily working through my blog posts to freshen things up and make sure that everything is working the way that it should so that you can have the most enjoyable experience possible. Stay tuned for more updates and lots of good stuff. Thank you so much for reading and for coming along on this journey with me! I appreciate you all very much. 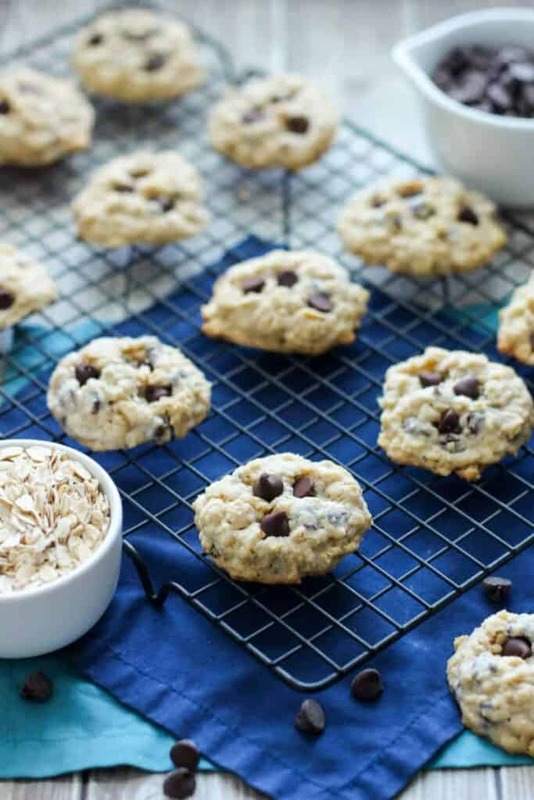 In the meantime, please enjoy some of these chewy Oatmeal Chocolate Chip Cookies! I think that you’ll be pretty pleased with them. I know I am. In fact, I’m eating one as I type this. This recipe comes from Bunsen Burner Bakery. If you haven’t been to her blog yet, I strongly suggest that you do. Of course the photos are beautiful, and the food looks and sounds delicious. But I’m also a fan because she, like me, is a scientist by day. Check it out! Preheat the oven to 350 degrees F. Line a baking sheet with parchment paper. Set aside. In a medium-sized bowl, whisk the flour, salt, and baking powder together. Set aside. In the bowl of a stand mixer, cream the butter and sugars together until light and fluffy. One at a time, beat in the eggs, followed by the vanilla extract. Add the dry ingredients to the butter/sugar mixture and beat until just combined. Add in the oatmeal in batches, stirring after each addition, until just combined. Stir in the chocolate chips until evenly distributed. Drop the dough by the 1.5 tablespoons onto the prepared baking sheets. Bake for 10-12 minutes, or until the bottom is golden brown. 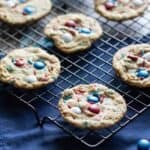 Allow the cookies to cool on the baking sheet for 10 minutes before transferring them to a wire rack to finish cooling completely. Haven’t had your fill of cookies? 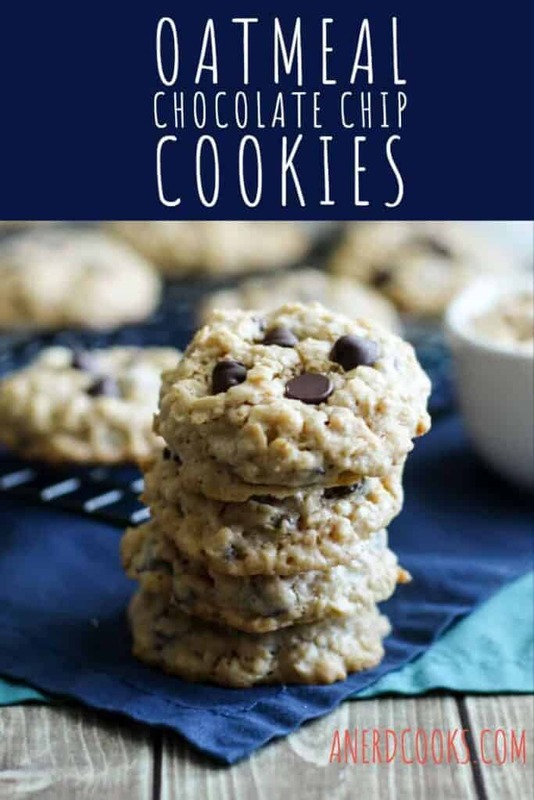 Check out these Thick and Chewy Oatmeal Raisin Cookies, Pumpkin Chocolate Chip Oatmeal Cookies, and Lemon White Chocolate Chip Pudding Cookies! 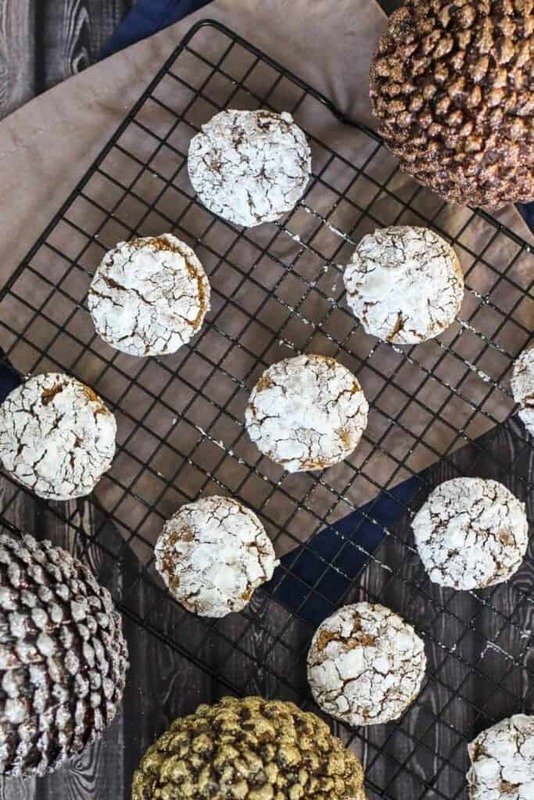 These Gingerbread Crinkle Cookies are soft, full of warm gingerbread spices, and have pretty, crackly-looking tops. To be honest, I’ve never been wild about gingerbread cookies. In my experience, they’re hard, dry, and just all around meh. It it just me? Or have I just been eating the wrong gingerbread cookies all along? 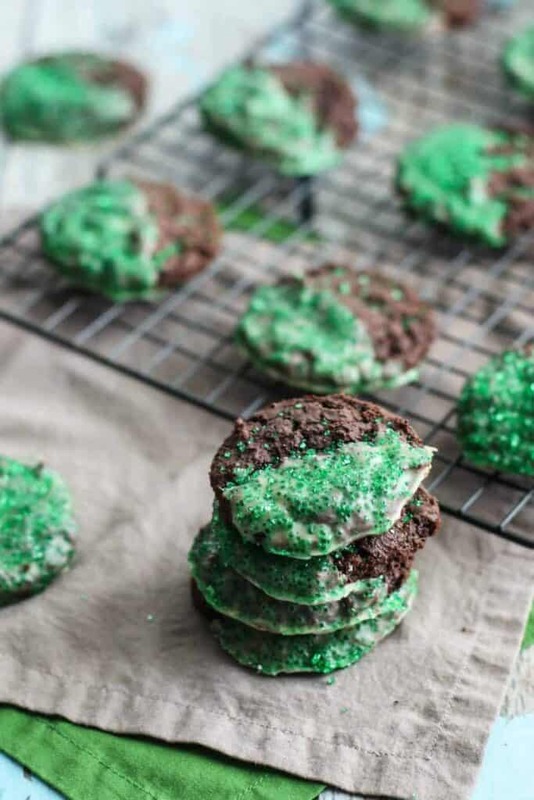 Regardless… THESE gingerbread cookies are something else entirely. They’re super soft and warmly spiced. The powdered sugar lends a bit more sweetness, in addition to allowing for the pretty, crackly tops. This delicious recipe comes from the blog Self Proclaimed Foodie. Based on the cookie scoop that I use, this recipe has consistently yielded 2.5 dozen. Depending on what you use, you may get 2-3 dozen. In the bowl of a stand mixer, combine the flour, sugar, spices, baking soda, and salt. Mix on low until combined. Turn the mixer off and add the butter that has been cut into pieces. Mix again, but at medium-low speed, until all of the dry ingredients are coated in butter. This will take about 1-2 minutes. Reduce the mixer's speed to low. With it still running, slowly add the molasses and heavy cream. Mix until the dough is evenly moistened and everything is combined. 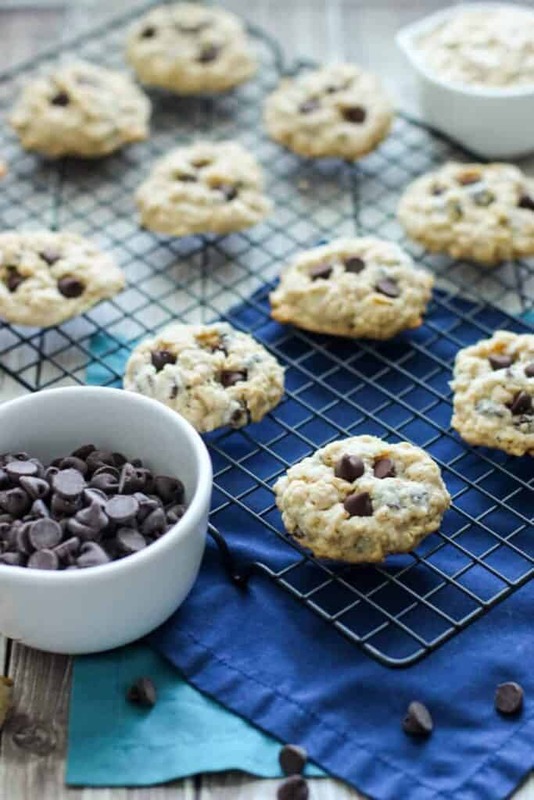 Using a cookie scoop, scoop the dough onto a baking sheet lined with parchment paper. Refrigerate the dough for 2 hours (or up to overnight) or freeze for 20-30 minutes. When it's time to bake the cookies, line another baking sheet with parchment paper and set it aside. Preheat the oven to 350 degrees F.
Roll the chilled dough in the granulated sugar until coated. Next, roll the dough in the powdered sugar (see notes). Place the dough balls on the prepared cookie sheet, approximately 1 inch apart from one another, and bake 10-12 minutes. Remove the baking sheet from the oven once they start to crack. 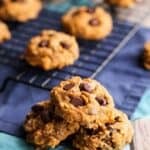 Cool the cookies on the baking sheet for a few minutes before removing them to a wire rack to finish cooling completely. I have used 2% milk when I didn't have heavy cream on hand, and nothing seemed to be adversely affected. When it comes to rolling the dough in the powdered sugar, more is more. 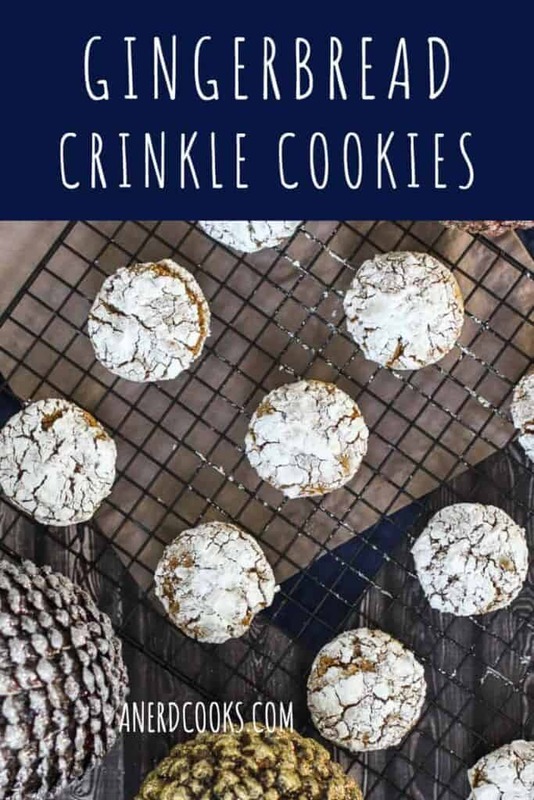 The first couple of times that I made these cookies, I skimped on the powdered sugar. Sure they looked like they were pretty much covered, but when they baked, the powdered sugar kind of melted. You're going to want to really coat them in powdered sugar. See the photo below for what you're aiming for. 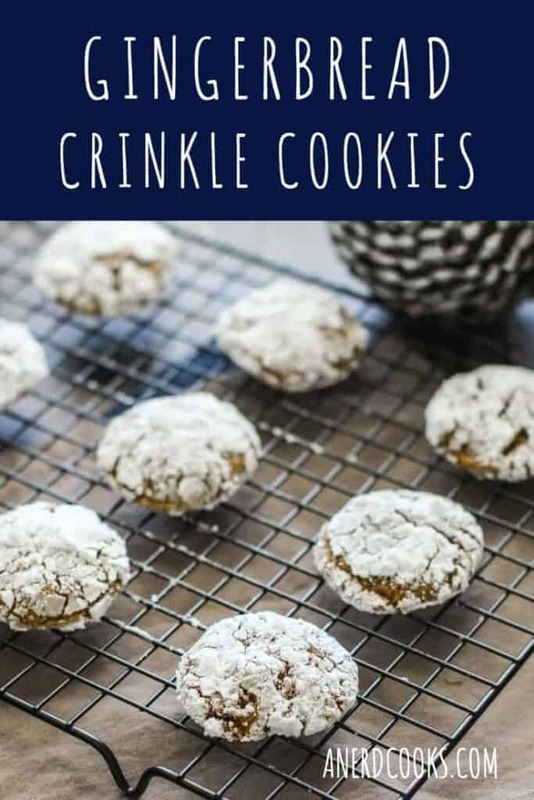 Need other holiday cookies? 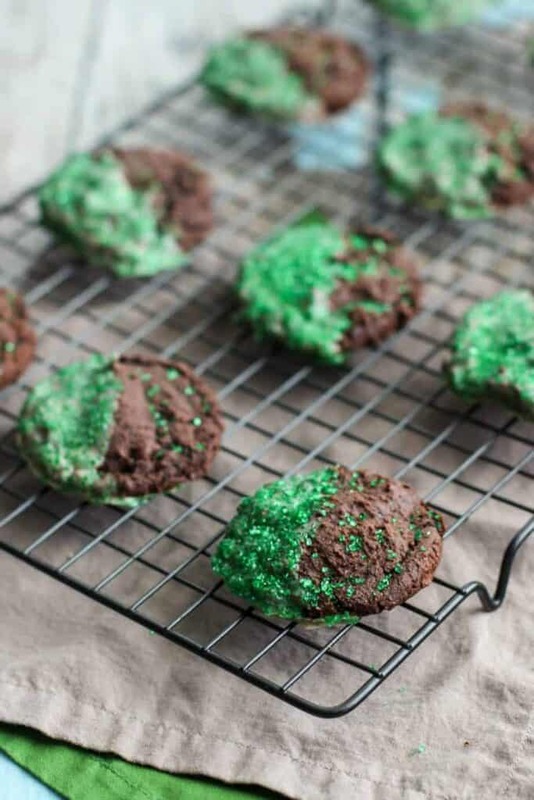 These Peppermint Mocha Cookies and Eggnog Cookies ought to do the trick! 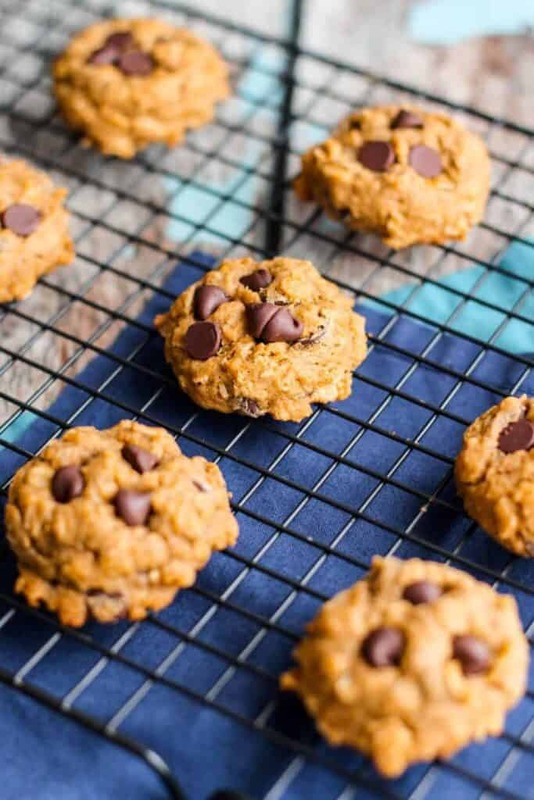 These Pumpkin Chocolate Chip Oatmeal Cookies are chewy, sweet, and full of pumpkin and Fall spices. So, it’s been a minute. I/we have been doing a bit of traveling and have had friends and family visiting us. I was promoted to Assistant Professor at Duke! We moved in last weekend, and are so happy here already. I’ll likely share some photos of the kitchen at some point, because it is GORGEOUS. But only after the inside of the house stops looking like a tornado passed through. As for the cookies? Well, they’re pretty fantastic. 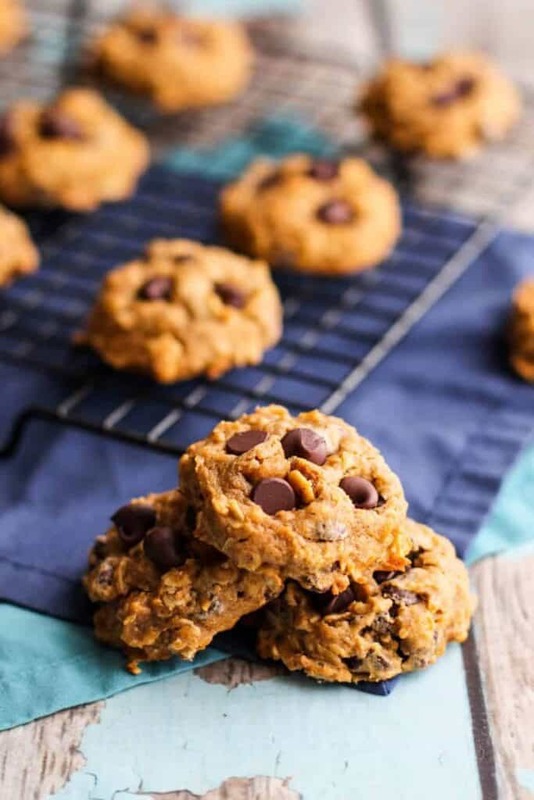 Unlike many pumpkin cookies (like these Pumpkin Chocolate Chip Cookies), these are chewy, not cakey. You have the oats and drained/blotted pumpkin (see instructions below) to thank for that. 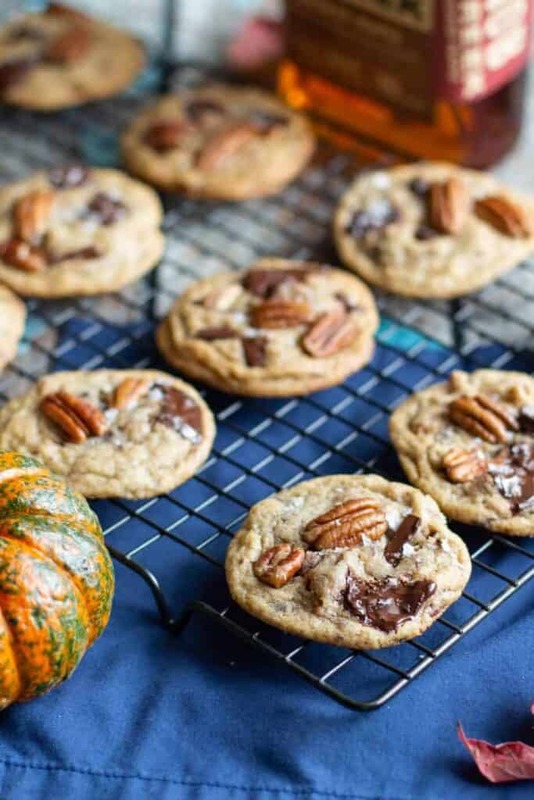 Beyond that, these cookies are full of pumpkin spice flavor as well as chocolate chips. This recipe comes from the blog Sally’s Baking Addiction. Line a medium-sized bowl with paper towels. Add the pumpkin puree to the lined bowl. Using the paper towels, squeeze a bit of the moisture out of the canned pumpkin. Check out Sally's blog for a visual. Removing some of the moisture from the pumpkin helps produce a less cake-like cookie. Which is what we're going for here. 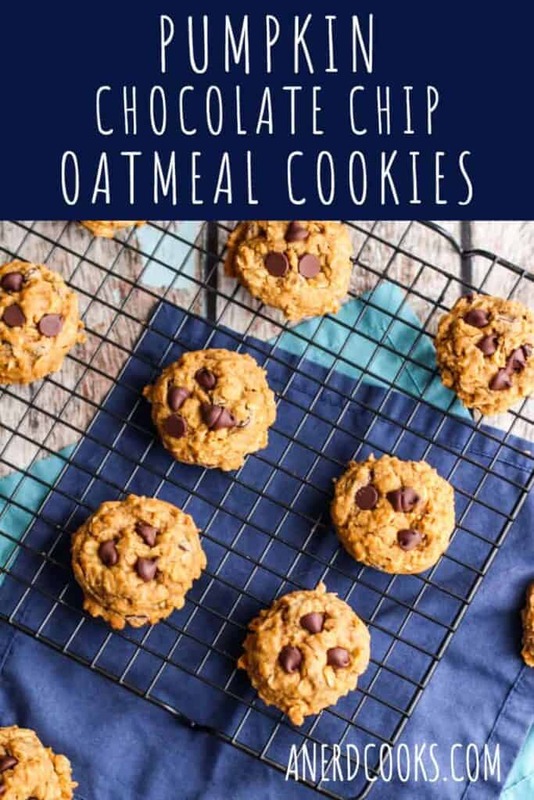 In another medium-sized bowl, whisk the flour, baking soda, spices, salt, and oats together. Set this aside. In yet another medium-sized bowl, whisk the melted butter, maple syrup, sugars, egg yolk, pumpkin, and vanilla extract together. Pour the wet ingredients into the dry ingredients and mix until combined. Fold in the chocolate chips. Using a cookie scoop, scoop ~1.5 tbs-sized balls of dough onto the prepared baking sheets. Smoosh the dough balls down slightly with your fingers. They don't spread much on their own, so they need some help in this department. Bake for 12-13 minutes, or until lightly browned on the edges. Remove the baking sheets from the oven. 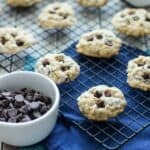 Press a few chocolate chips into the tops of the cookies while they are still warm. Allow the cookies to cool for 5 minutes on the baking sheets before removing them to a wire rack to finish cooling completely. 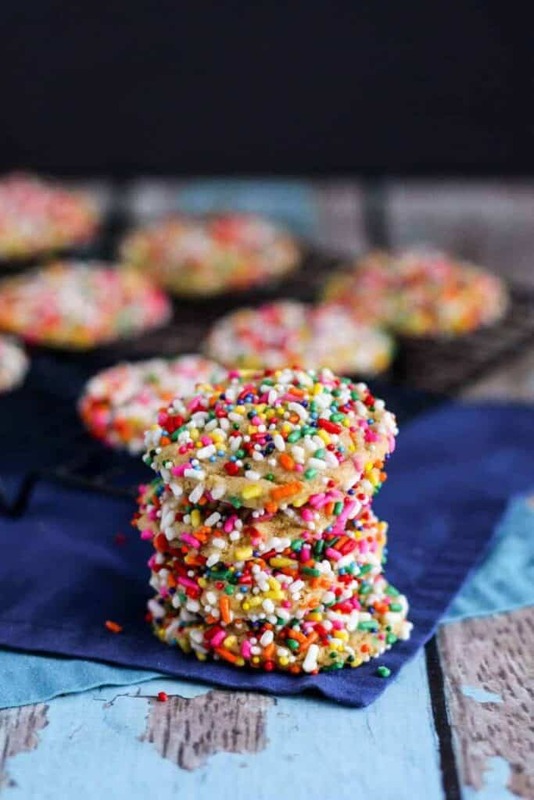 These Confetti Pudding Cookies are super soft, full of sweet vanilla flavor, and covered in colorful sprinkles! 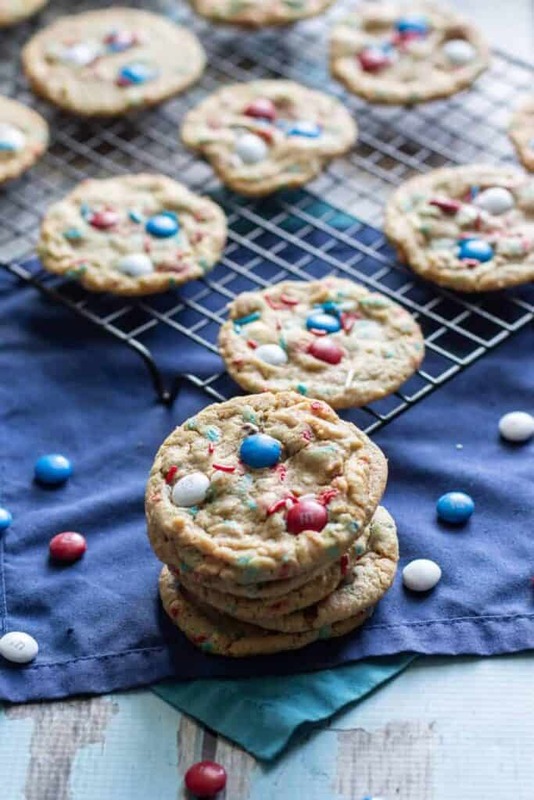 I originally intended to cover these cookies in red, white, and blue sprinkles for the 4th of July, but after trips to 2 different grocery stores, couldn’t find sprinkles in those colors. Very disappointing. They were going to be Firecracker Pudding Cookies. 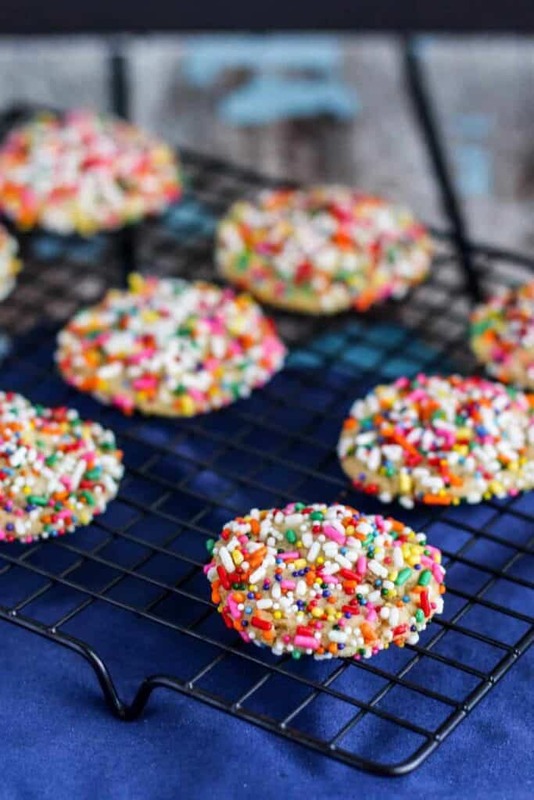 Once I resigned myself to using multicolored sprinkles, I really debated calling them Funfetti Pudding Cookies. But I feel like they’re not technically Funfetti since the sprinkles are only on the outside and not the inside, too. Anyway, I settled on Confetti Pudding Cookies. Still an okay name, right? At least the cookies are cute. And they taste great. 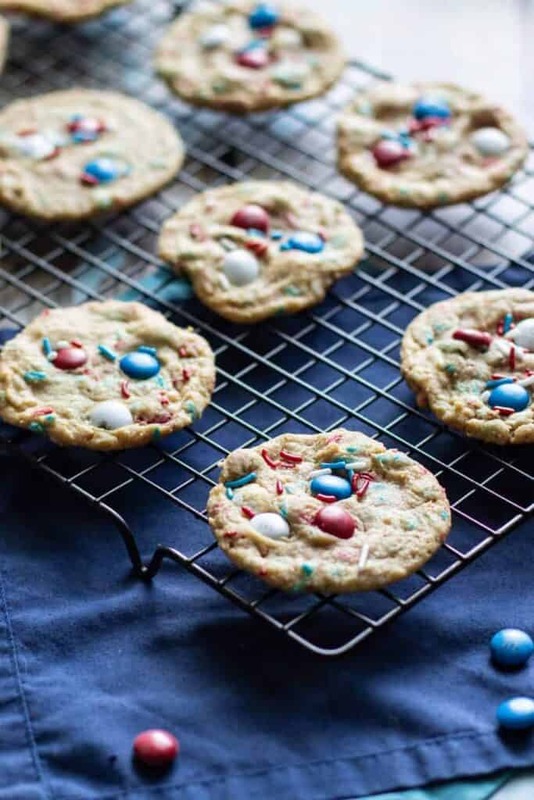 The sprinkles make the outside a bit crunchy, while the cookies themselves are soft and tender. 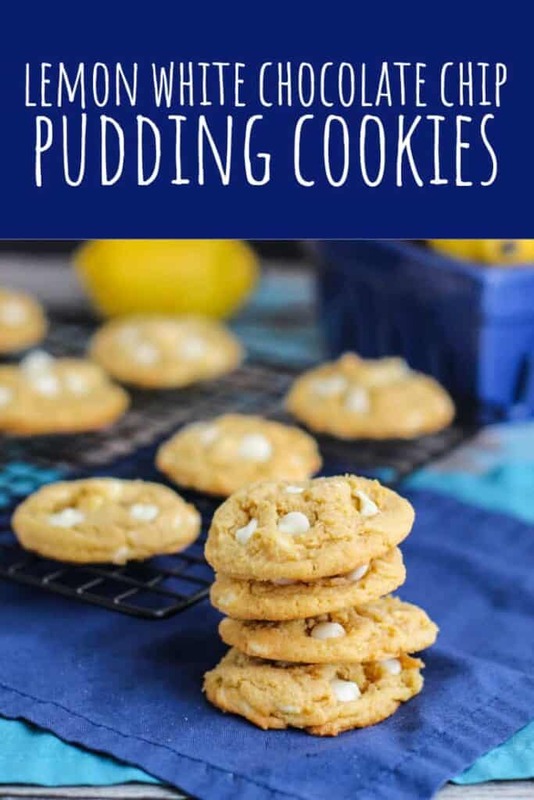 The original recipe for Pudding Cookies comes from Crazy for Crust; I’ve also shared Lemon White Chocolate Chip Pudding Cookies and Chocolate Cookies and Cream Pudding Cookies, too. Add the pudding mix, baking soda, and kosher salt. Mix until combined. Add the flour. Mix again until well combined. Scrape down the sides of the mixing bowl as needed. 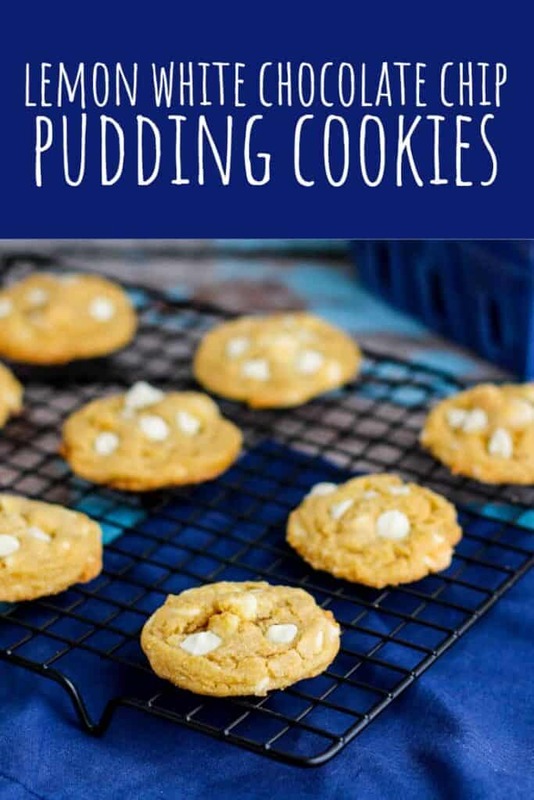 Add the white chocolate chips and mix on medium-high speed until they are well distributed throughout the cookie dough. Line a baking sheet with parchment paper. Pour the sprinkles into a shallow bowl. Scoop ~2 tbs balls of dough and roll it around in the sprinkles. 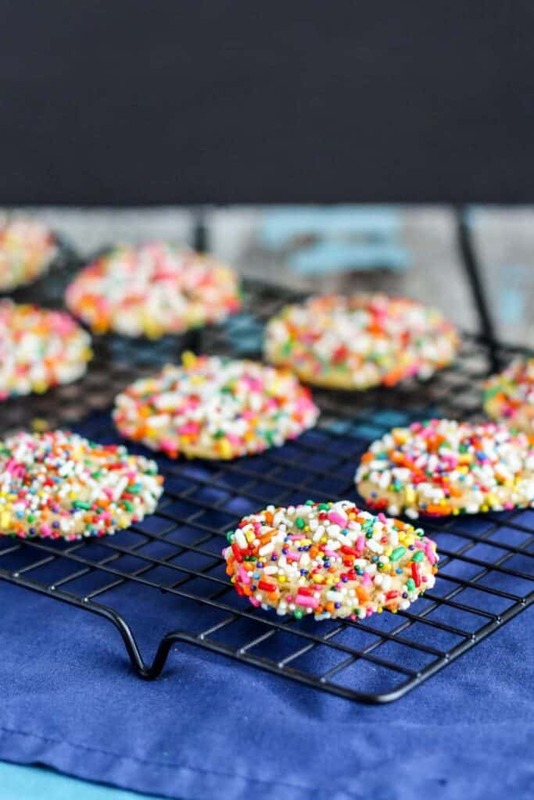 Place the sprinkle-covered dough balls onto the prepared cookie sheet. Cover and chill for at least 1 hour. 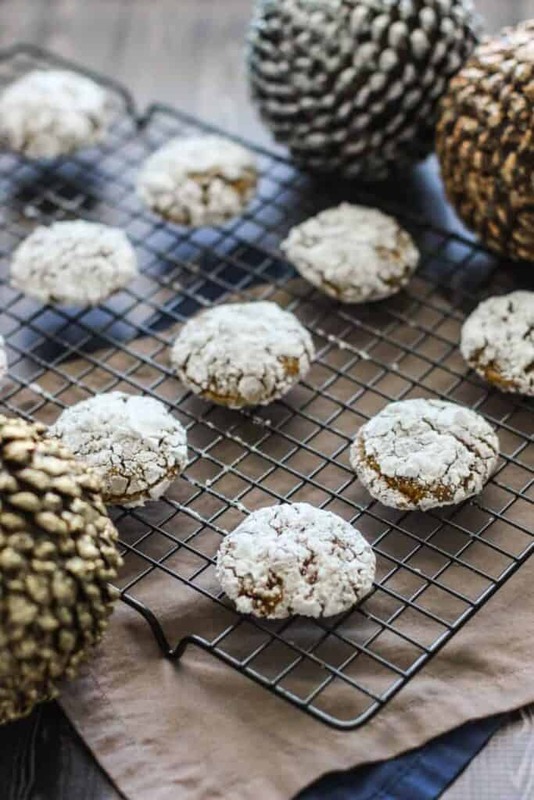 Remove the cookies from the oven and allow the cookies to cool on the baking sheets for 5 minutes before removing them to a wire rack to finish cooling completely. 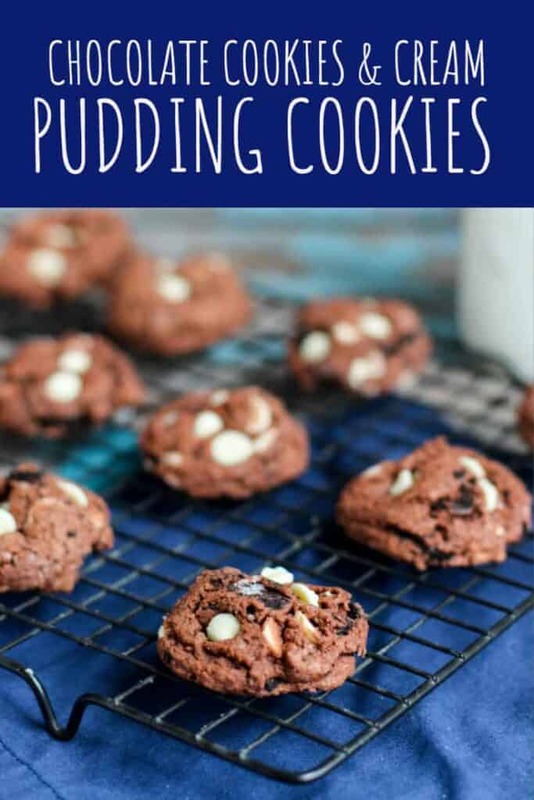 These Chocolate Cookies and Cream Pudding Cookies include a beloved flavor combination baked into super soft pudding cookies. Honestly? I’m not sure what to say about these cookies. What is there to say, really? 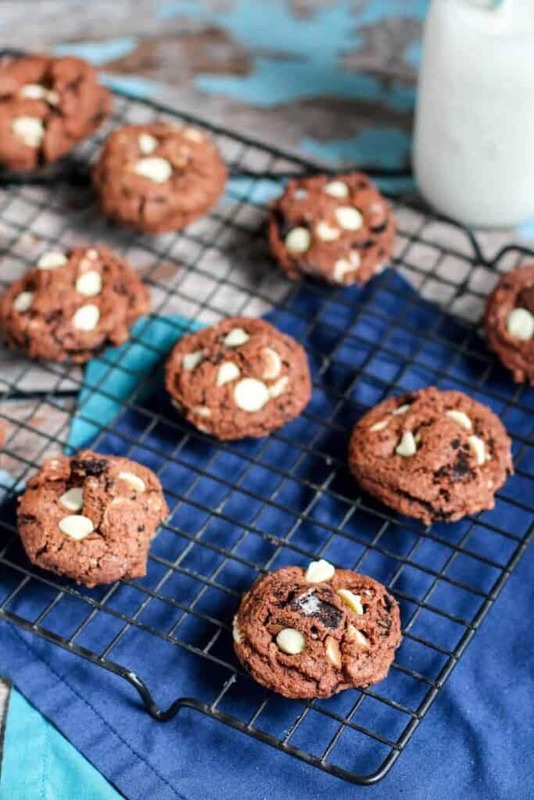 They’re super soft, chocolate pudding cookies studded with white chocolate chips and chunks of Oreo cookies. In my opinion, cookies get no better than this. Then again, I’m fairly obsessed with cookies and cream, well, everything. 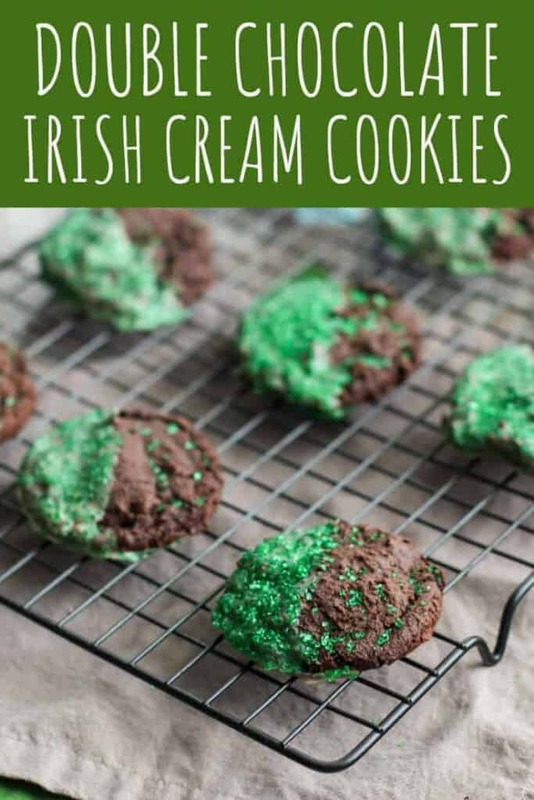 Check out the bottom of this post for more cookies and cream-flavored recipes! The original recipe comes from Crazy for Crust; I’ve also shared Lemon White Chocolate Chip Pudding Cookies, too. 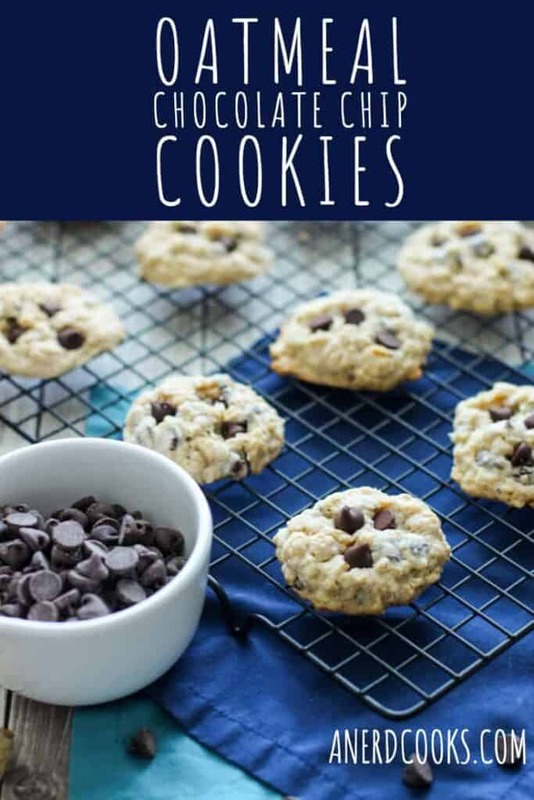 Add the white chocolate chips and chopped Oreos and mix on medium-high speed until they are well distributed throughout the cookie dough. Line a baking sheet with parchment paper. Scoop ~2 tbs balls of dough onto the prepared cookie sheet. Cover and chill for at least 1 hour. Yes, this step is necessary. Need more cookies and cream-flavored desserts? I got you. 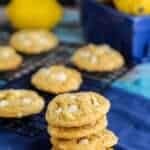 These Lemon White Chocolate Chip Pudding Cookies are super soft and packed with bright, zingy lemon flavor. It’s official: pudding cookies are my new go-to cookie. 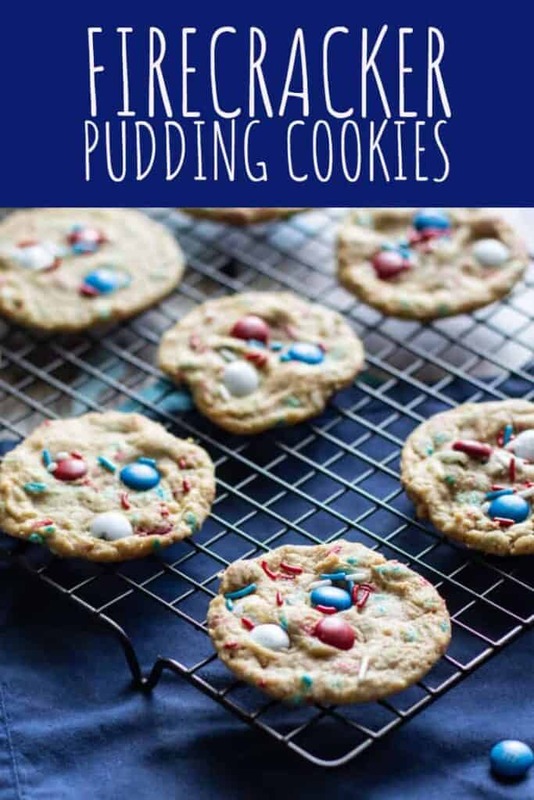 They addition of pudding mix ensures that they are super soft, bake up perfectly every time, and can be flavored however you like. 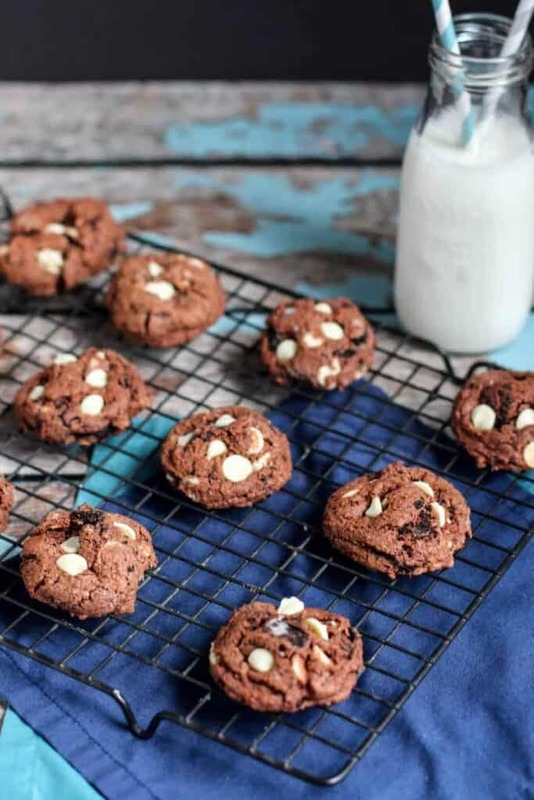 Want a more traditional chocolate chip cookie? Use vanilla pudding + chocolate chips. Is pistachio your jam? Use pistachio-flavored pudding. You get the idea. 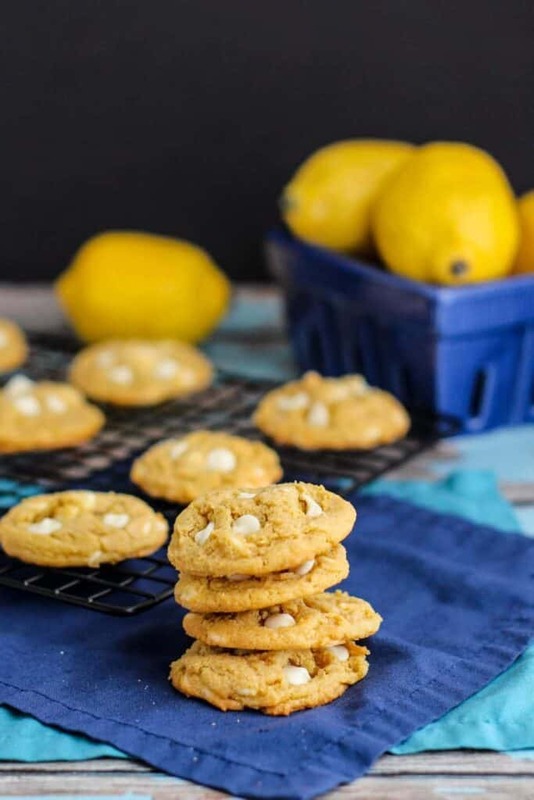 Beyond being delicious, lemon and white chocolate strike me as being a perfect flavor pairing for spring time. 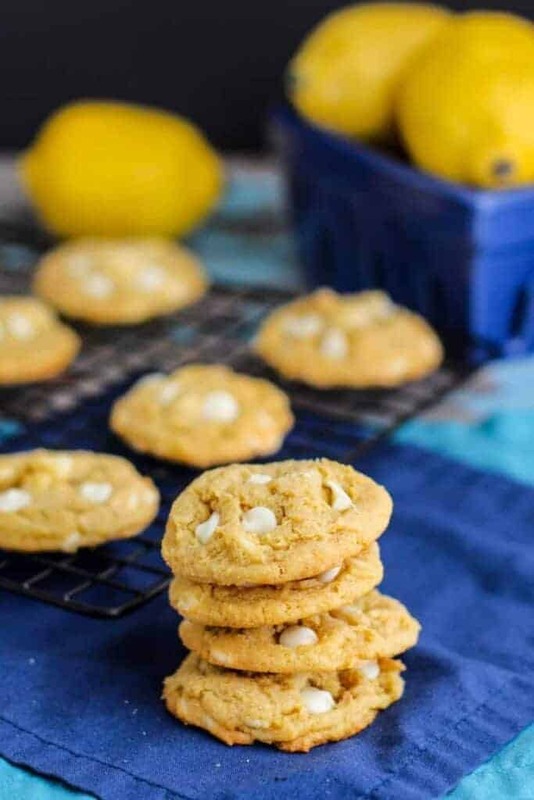 The sweet and tangy flavor combination is also a refreshing alternative to all-sweet cookies. 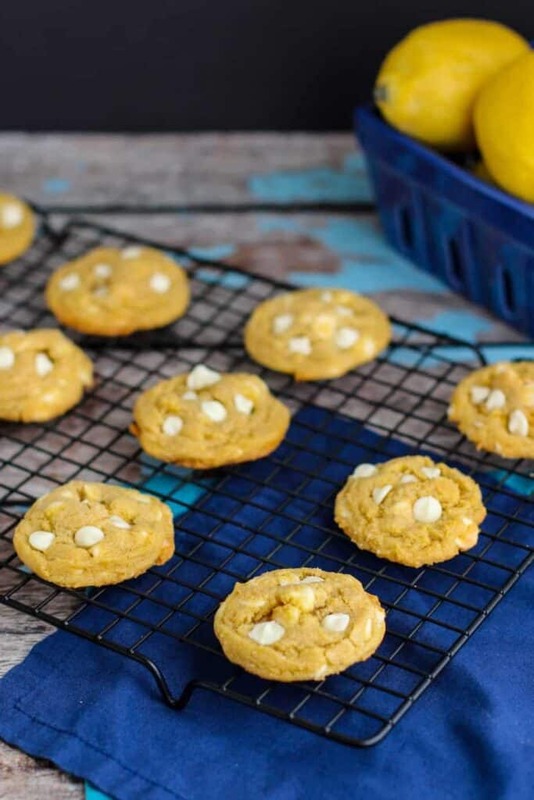 In the mood for more lemony treats? Check out these Pink Lemonade Cupcakes and Whole Lemon Bars! 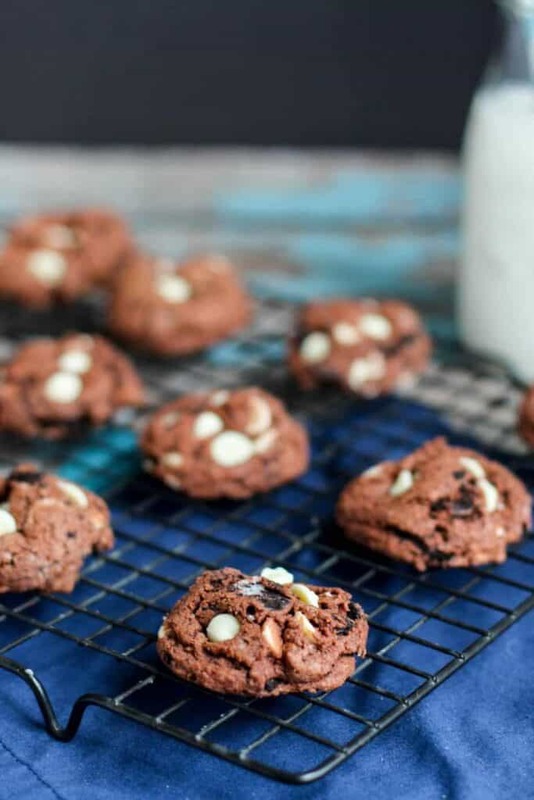 These cookies are adapted from the recipe found on Crazy for Crust. In the bowl of a stand mixer, cream the butter and brown sugar on medium speed. Mix in the egg and lemon extract until smooth. Add the pudding mix, baking soda, and salt. Mix until combined. Add the flour. Mix again until well combined. Scrape down the sides of the mixing bowl as needed. Add the white chocolate chips and mix on medium-high speed until they are distributed throughout the cookie dough. Line a baking sheet with parchment paper. Scoop 2 tbs balls of dough onto the cookie sheet. Cover and chill for at least 1 hour. Yes, this step is necessary. When you're ready to bake the cookies, preheat the oven to 350 degrees F. Line two additional baking sheets with parchment paper. Place the chilled balls of cookie dough on the prepared baking sheets, approximately 2 inches apart. Bake 9-11 minutes, or until the edges just start to turn brown.